Istanbul (AFP) - Turkey on Tuesday arrested 24 people, including former senior officials in its telecoms and science agencies, in a new wave of raids against suspects accused of wire-tapping senior officials including President Recep Tayyip Erdogan. The official Anatolia news agency said prosecutors issued warrants for 28 people in Ankara, Istanbul and other cities, with those arrested including ex-employees of the telecommunications agency TIB and the TUBITAK science and technology agency. Anatolia said it was the fourth raid targeting suspects in the illegal wire-tapping case, which is linked to last year's stunning corruption allegations against Erdogan and his inner circle that were based on bugged telephone conversations. Among those targeted are the former deputy head of TUBITAK Hasan Palaz and communications agency former deputy chief Nihat Sen.
Anatolia said that encrypted phones used by Erdogan had been wiretapped 55 times during his term as prime minister. Most of the wiretapping took place in December 2013, when the corruption scandal broke. As with previous raids, the current swoops and their targets were predicted with extraordinary precision by the mysterious Twitter user Fuat Avni before they even took place. The identity of Fuat Avni, who likes to refer to Erdogan as the "tyrant", remains a mystery with some speculating the person could be a high-ranking government official. 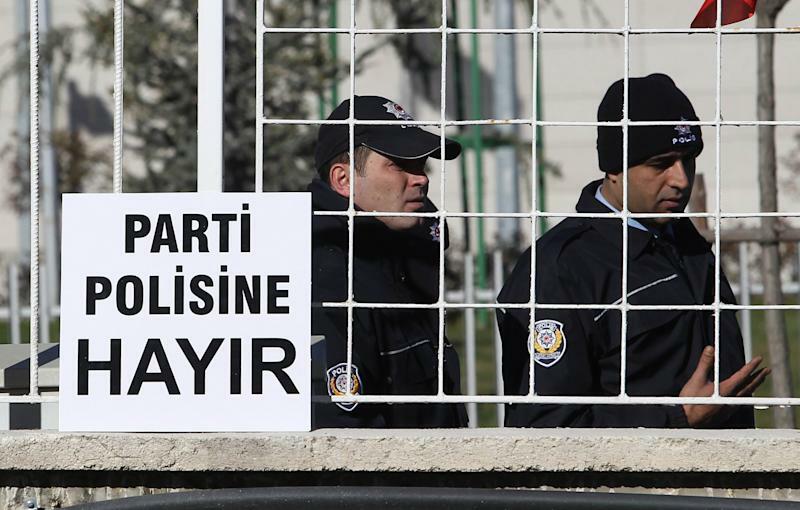 An Ankara court on Tuesday ruled to shut down Fuat Avni's Facebook and Twitter accounts. The government has repeatedly blocked Fuat Avni's Twitter accounts with the user simply moving to another address. Erdogan has blamed US-based Muslim cleric Fethullah Gulen of concocting the corruption scandal using a "parallel state" of officials loyal to him in the police and the judiciary. In a separate development, police chiefs have been sacked in 21 provinces, according to a statement published in Turkey's Official Gazette. Leaked tapes emerged in February 2014 where Erdogan allegedly told his son Bilal to dispose of some 30 million euros ($37 million) in cash. 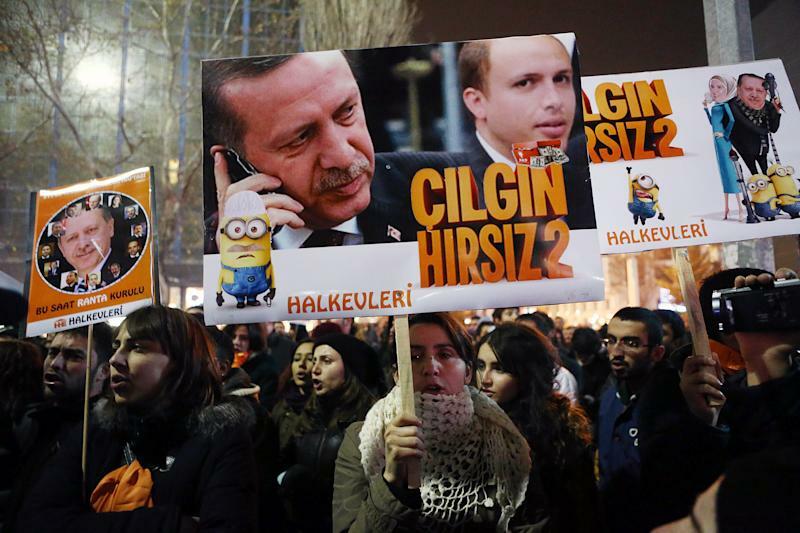 Erdogan has dismissed the recordings as a "vile montage". According to Fuat Avni, Erdogan was "outraged" that the recording surfaced and has ordered that it must be destroyed. The first trial in the case opened on January 2 of 13 suspects accused of setting up bugs to eavesdrop on Erdogan while he was prime minister, including his former top bodyguard and the head of the prime minister's security department. Erdogan's government has sacked thousands of police and scores of judges and pushed through legislation tightening state control over the Internet and the judiciary, raising questions at home and abroad about the state of democracy in Turkey. The president on Monday signalled that crackdown against Gulen supporters will widen, saying "there is still so much left to be revealed." "There's so much that has been kept inside. All will be revealed in the days to come," Erdogan told an energy summit in Ankara. "We will do whatever necessary against this." 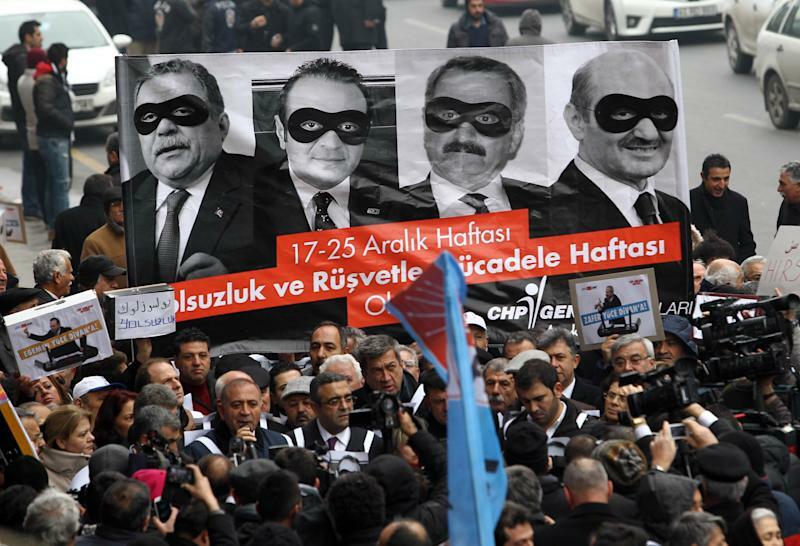 The parliament was on Tuesday to vote whether four former Turkish cabinet ministers will stand trial on graft allegations that were at the centre of the scandal. A parliamentary commission earlier this month ruled that they will not have to stand trial and with the ruling Justice and Development Party (AKP) enjoying a comfortable majority in the chamber, the decision is expected to be rubber-stamped.